M65 and M66 are two of the galaxies that make up the Leo Trio of galaxies. The two galaxies are about 160,000 light years apart and about 35 million light years from us. In the sky, they appear about a third of a degree apart. The two galaxies are gravitationally interacting with each other as well as the third member of the Trio, NGC 3628. Astronomers believe that M66 had a very close gravitational encounter with NGC 3628. As a result, M66 displays some significant warping as well as areas of starburst formation. While M66 seems to be quite disturbed from the encounter, M65 appears quite normal - looking much like a typical spiral galaxy. In this photo, North is Up. This image is cropped to 63% of the original full frame. Software Used Images Plus 5.0 for camera control, calibration, stacking, digital development, star shrinking, smoothing and noise reduction, advanced Lucy-Richardson deconvolution, and multiresolution sharpening. Photoshop CS5 used for levels and curves, high pass filter, star shrinking, screen mask invert, lab color, saturation adjustments, selective color, vibrance, match color, and smart sharpen. Gradient Xterminator for gradient removal. Carboni Tools for additional noise reduction, and smoothing. HLVG for additional color correction. Registar for aligning stacks and composites and for color channel alignment. Focus Magic for focus restoration. Notes I was quite thrilled with this image, as I felt that the contrast in color between the two galaxies is quite striking. Both of the galaxies show some very nice detail, and the background is nicely littered with some very faint background galaxies. 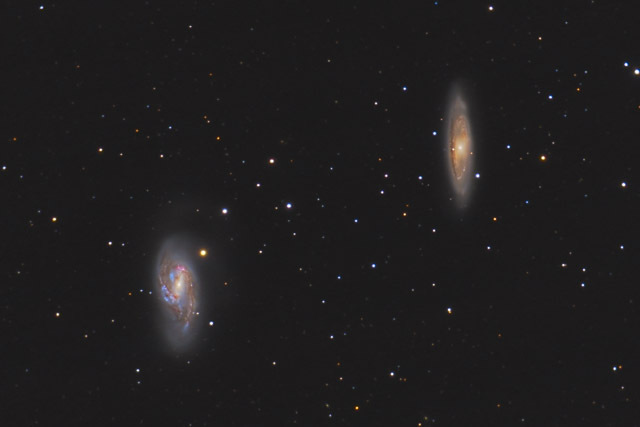 This image won Astrophotogallery.org's March 2013 Hard-Galaxy category.